Built during the Safavid Era, the 400 year old Imam mosque or Shah mosque is recognized as one of the most beautiful mosques in Iran and of its kind; revered as a significant monument in the realm of Islamic architecture. -This phenomenal masterpiece of design and craftsmanship is a part of the Naghsh-e Jahan Square complex; making it an integral and highly treaded destination of Isfahan throughout the ages. Imam mosque, goes by many names; also known as Masjed-e Imam, Masjed-e Shah, Masjed-e Jaam-e Abbasi as well as Imam mosque and Shah Mosque of Isfahan. It is built in the Isfahan-style of Islamic architecture; Imam mosque is a splendid tribute to the phenomenally detailed and intricate tilework and woodwork of traditional Persian art. It can be said with confidence that the iconic mosque has probably been photographed many fold over each centimeter of its glorious mosaic designs. Allured visitors and tourists will get the gist of how many photos this really amounts to, once standing amongst its mesmerizingly intricate works of beauty! Come along with goingIRAN to see and discover more about this beautiful destination! 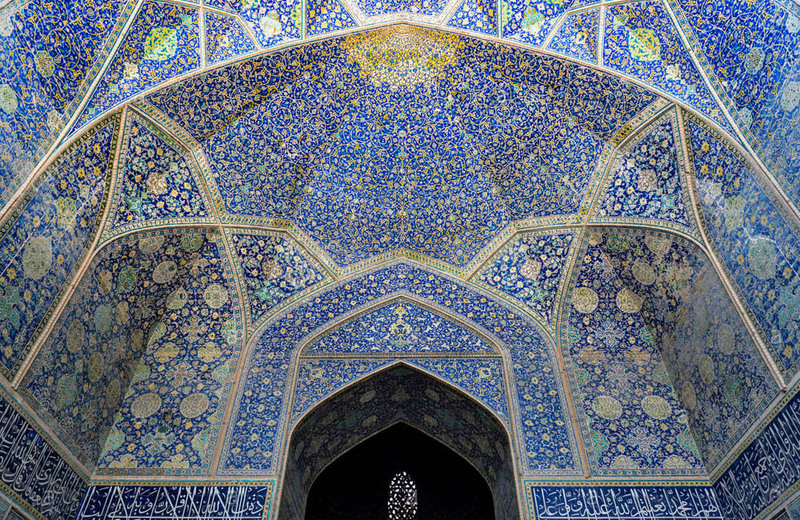 The majority of the ornamentation at Imam mosque is in the stunning haft rang technique. A rainbow of colored floral and calligraphy patterns run throughout the mosaic covered walls, dome and just about everywhere in the royal mosque. Built by 18 million bricks and 475,000 tiles, the incredible mosque presents us with many unique features and characteristics. Travelers of this destination will be a witness to displays of Persian artistry and ingenuity at their best. Even before entering, the most obvious one is the overall shape and layout of Shah mosque. As like any other mosque the main building faces Mecca, but strangely its giant entranceway doesn’t! After much speculation, scholars realized that the reason behind the varying angles of the main structure and its glorious entrance had a lot of considerations put into it. 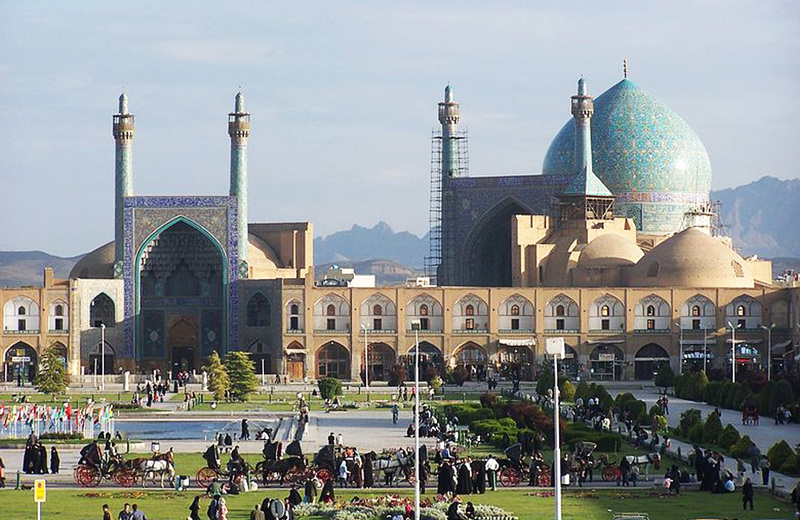 With features like the massive entrance, four towering minarets, and dome, if the entire compound were to be facing Mecca, its beautiful blue dome would not been seen from Naghsh-e Jahan Square. However, with this clever layout, the magnificent dome can be vividly seen from any point in the massive square! It all started a little of a decade after Shah Abbas decided to move the Persian Empire’s capital to the desert oasis city of Isfahan; from Qazvin in 1598. Isfahan made for a very strategic location for the Persian Empire from there onwards. It was great. Zayanderud provided an abundance of freshwater and the geographical location, itself, distanced them further attacks from the Ottomans and simultaneously gave easier access to the Persian Gulf – a key trading route for the Dutch and Indian companies. This focus on Isfahan city was a very crucial move in the development of Iran’s culture and the making of many traditional Iranian monuments. The tedious construction began towards the final decades of the Safavid Dynasty in early 17th century. Taking 18 years to complete, its construction started in 1611 and finished in 1629. Coincidently, the year of the mosque’s crowning of its beautiful blue dome was also the last year of Shah Abbas’s reign. Fortunately, the Imam mosque has remained completely untouched and virtually unblemished, through its 400 years of life! Entering through the legendary 30-meter-tall entranceway, visitors can admire the beautifully written poems and traditional handcrafted patterns done by the hands of that era’s finest artists and craftsmen. The entire Imam mosque is known as a ‘masterpiece’ accomplished by the top master artists of the Safavid Era. The giant mosque complex boasts four minarets; the two interior ones standing at a staggering 48 meters and the pair by the entrance a tall 42 meters! The height of its enchanting dome is a whopping 52 meters above ground level! One of the most famous features of Imam mosque lies directly under its enchanting colossal dome. The building and dome have been constructed in such a way where when a person stands right under the dome’s center, their voice echoes all throughout the entire area! Potentially, a friend some 40 meters across from you could easily make out what you are saying, given the right conditions! Quite a nifty feature for the time of no electricity or electronic speakers! Imam mosque has two mirroring shabestans on its east and west wings. The one the east is larger, but quite simple in its design. 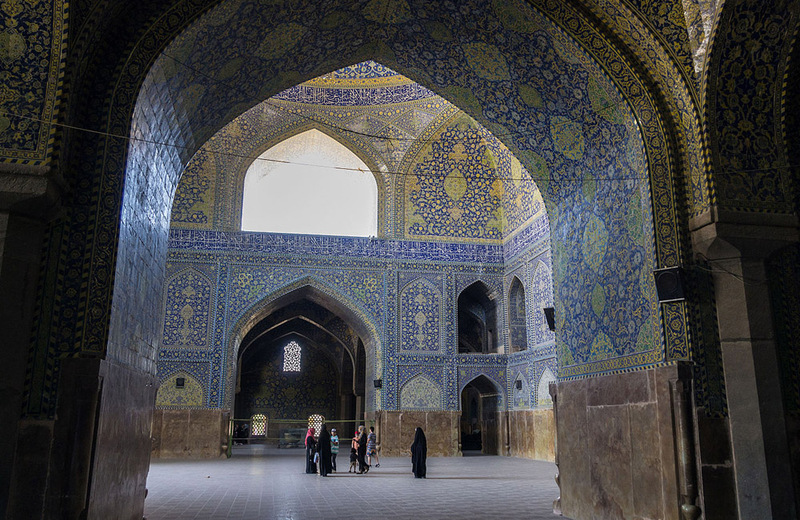 The other, in the west wing, is a bit smaller, however is absolutely adorned with beautiful haft-rang (seven-color/rainbow) tilework. Also among its pleasantries, the west wing’s mihrab is known to be one of the most beautiful in Isfahan’s long list of mosques! Another eye-catching feature of the Imam mosque is the huge one-piece carved slabs of marble, encompassing the bottom of the walls. Being able to find marble of such quality grade at that size would definitely be a very expensive endeavor! Moving along, inside one of the two schools located at the south of the Imam mosque structure, lays a carefully placed stone fixture. This monumental apparatus designed by Sheikh Bahai, a famous scholar and mathematician of the time, reveals the time of ‘true noon’ in all four seasons. Another noteworthy and distinct feature of Imam mosque is the existence of seven wonderfully crafted sang-ab. A sang-ab (translating to water stone) is a large vessel that is used in mosques to hold water to be used for vozu/wudu (pre-prayer cleansing). The seven sang-abs at Shah Mosque are made from various materials such as jade, marble and limestone. They are quite exquisite in their design, showing off beautiful Persian floral pattern carvings. Located on the south side of Naghsh-e Jahan Square, this is one destination in Isfahan that will be quite hard to miss!